while serving with US-led coalition forces in Iraq. Given this image's inflammatory nature, I posted it with a great deal of trepidation. I had a hard time deciding if it was the right thing to do, and I am still not sure. No, I didn't have the consent of the families of those pictured, and I apologize for any additional pain that this image causes them. That said, I must say that it is my belief that one distinguishing characteristic between art and other forms of speech is that art takes risks, and if we, as a society, value art, we must allow it more leeway than other modes of expression to incite or offend. War President is meant to be a satirical commentary, informed by the whole project of using the dead as political props. I'm not making a dime off the image, and never will attempt to do so. Given this lack of financial—or other crass—motive, other recent instances of the politicization of the dead strike me as more morally questionable: the coffins of the victims of 9/11 showing up in a political advertisement, the continued suppression of images of the funerals of those lost in Iraq from the mainstream American media, and images of the 9/11 disaster in a campaign ad. A certain party stands to benefit greatly from all three of these instances of politicization. I'd also like to point out that War President is an image. It is not a textual statement or rhetorical argument. An image is like an empty room, and any message that one reads in that room necessarily came in the baggage one carried when one walked in the door. 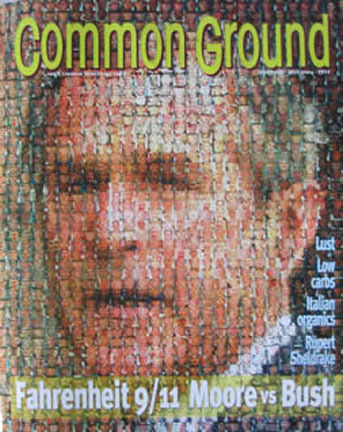 If I made a mosaic of George Washington composed of images of the American dead from the revolution, would viewers likely take that image as an indictment of Washington? I submit that they would not. It would be viewed as a monument to the dead and a celebration of a great leader—a somewhat maudlin monument maybe, but surely not offensive. The fact that War President is not viewed in such a manner is not due to any intrinsic property of War President, but lies somewhere else. I just watched We Were Soldiers last night as a reminder of what it means to sacrifice yourself on the altar of a politician's lies. When I went to michaelmoore.com today and saw that mosaic, I cried. I cried for my brothers-in-arms who have given everything they had—and shattered their families lives—for this foolish president's personal vendetta. I hope that image remains burned into the minds of everyone who sees it as a reminder of why we have to remove this fool from office in November. Thank you for creating that image Joe. As a veteran, I'd like to thank you for taking the time to create that stirring image and having the courage to post it. And I also like the way that so many of the posters here seem to be reading their own fears into it. Every time I see a photo or video of Bush, I shudder and wish he never existed, and every time I see p/v of dead or wounded American soldiers and Iraqis, I think of how they would all still be alive today if Bush had never existed. Between Joe's art and the events occurring this week in Iraq, I am angrier than I've ever been since the Supreme Court handed GWB his early Christmas gift in 2000. Thanks a lot, Joe, for raising my blood pressure and making me even less fun to be around. If that's what you intended, then you've been a success. Let's hope you have the same effect on enough people so that we overcome our self-defeating liberal elitism and send Bush back to his ranch to slaughter his farm animals rather than our, and Iraq's, young men and women. After learning that AOL has blocked this powerful image from being sent via email, I decided to add it to my Web site (with full credit and links to this site, of course). I'm a Vietnam veteran and this image has profoundly affected me. Thank you for your very clear statement about the cost of war. I am deeply moved by your work. When young men and women join the military (a wholly voluntary action these days), they do know that they may be sent to kill, and possibly be killed. That means they entrust us, the American people, to elect leaders who will hold their lives as a sacred trust, who will never put them in harm's way lightly, who will exhaust all other possibilities before starting wars, and who will go to war only when our cause is just. Bush has betrayed that trust. This war is unjust. This war is inexcusable. This war is based upon lies and lies and lies. The lives lost in this war—American, Allies, and Iraqi—are irreplaceable. This war is an obscenity. That's why this image breaks my heart. Because none of those men and women had to die in Iraq. They died for Bush's lies. And that's not what they signed up to die for. We failed them too. The least we can do is vote out the regime that put them in this horrible war, wrap it up, and get out. Soldiers do not choose; they follow orders, and choice goes out the window the day they get to basic training. Hopefully, their Commander and Chief does not dishonor their valor and courage by using them for personal gain or vendetta. Iraq is not about freedom, and it is not about 9/11, and no matter how many times people repeat this lie it does not make it true. Did these soldiers serve their country with distinction? Yes! Should we support and honor them? Yes! And the best way we can do that is to get their comrades who are still stuck in Iraq out of there as quickly as possible and demand the Commander and Chief take responsibility for this dishonorable war. Bravo, Joe! 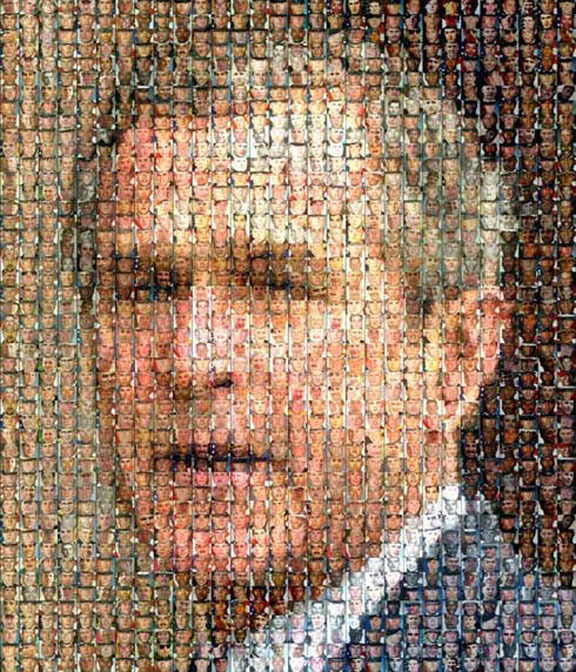 I wonder how much larger a picture would be made from the faces of the children who died from Bush's bombs—a lot larger, I dare say! Thank you for this powerful image.